Uglyworld #96 - Choccy For Everyone, originally uploaded by www.bazpics.com. Last week I was in Marburg with work and 4 of the guys tagged along with me and were lucky enough to see a lot of the city and it's key landmarks like it's Castle and main Church (Dom as they call them in Germany). On Sunday night as I was packing my case ready to head back to Marburg again this week there was a "family conference" being held to decide who was getting to come with me this week. At the end of the debate (which went on for quite some time) it was decided that Green Ox, Yellow Jeero, Pink Wedgehead, Pink Babo and Red Wage would get to accompany me this week. 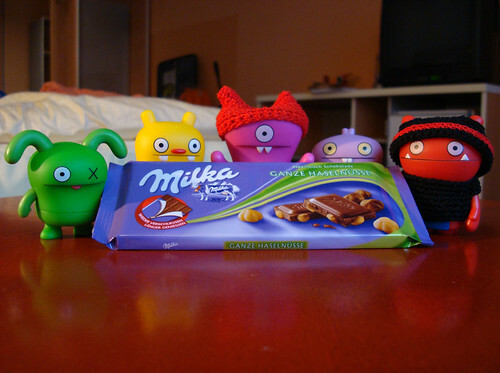 Unfortunately right now my workload is so high that I'm rarely having time to do anything, let alone show these guys around the city - so to make up for it I brought them back a nice big Hazelnut Milka bar to eat this evening (also keeps them quiet while I'm working through a mountain of paperwork in my hotel room). The little guys also gave me stick for not commenting on so many other cool pics out there at the moment, but once I explained to them that it's only due to my workload being so high at the moment they took that onboard and started ripping the wrapper off that choccy!! !